Out of three food trucks I’ve seen here in downtown Harrisburg, the only one that seems to have survived is Mad Sandwiches, a royal blue truck with bright green lettering. It can be found in two locations in the city on different days, up near the Keystone Building on Forester Monday – Wednesday, and down by Strawberry Square at Walnut and Third at the end of the week. I generally hit the one near the Square since I do try to only treat myself occasionally and a Friday for lunch works well. Prices are about average for anything you might get downtown, except for maybe a $5/footlong at Subway. And, well there is a reason those are only $5. I’ve fallen into my usual bad habit at a restaurant, finding something good and then being reluctant to try anything else in case I get disappointed. So, as of now, I’ve only had the beef empanada. For $2.50 (as of today), I get a tasty fried pie, about 7 inches across the fold, that is filled with beef, veggies, spices and the required green olives. At least I require them, that tangy, savory hit is what makes a empanada not any ol’ meat pie. It’s deep fried, having the clear blisters on the crust like my dearly lamented fried cherry pies that McDonald’s used to have (always with that one pit to crack my teeth on). It comes with either mild or spice sauce. I get the hot and it’s tasty though not much hot at all, appearing to be essentially a salsa verde. Of course, I’m the gal who happily orders vindaloo to be “Indian hot”. The acidity of the salsa cuts the slight greasiness of the deep fried pie well. The soda in the photo is a good basic cream soda. A beer would really rock with this, but as it is, I’m suprised no one bothered me swigging an amber beverage outside. With both it came to $4. Not bad for something unusual and good, at least here in central Pennsyltucky. 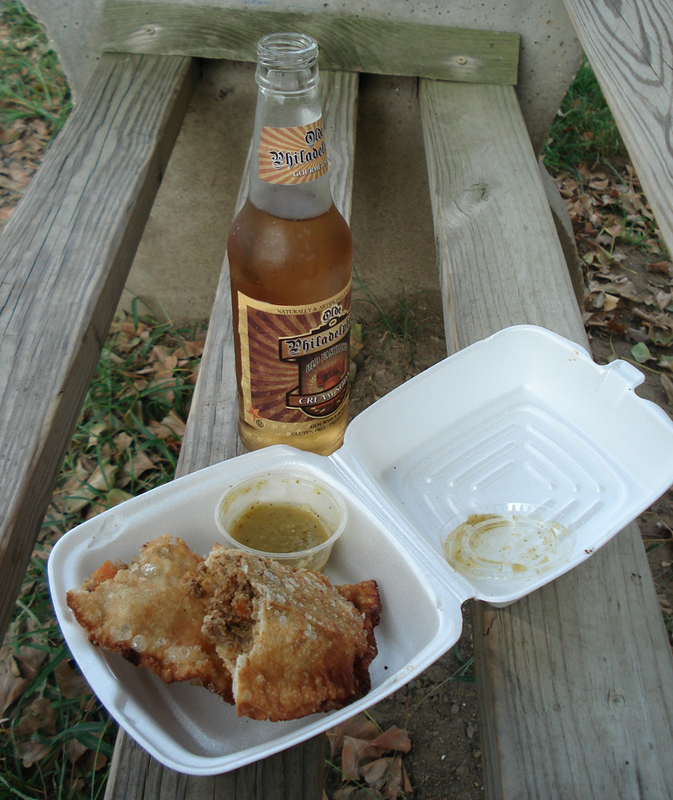 An empanada and a soda are more than filling for a lunch. Now I just have to get around to trying those pork sandwiches I’ve heard are so good. Last week we ventured up to State College, PA, home of Penn State University. Husband had a job interview up there and I acted as pilot so he could spend sometime relaxing before getting grilled about various kinds of IT craziness. As usual, we looked for somewhere to get food and a beer up there since we rarely get up in that area. We found Otto’s Pub and Brewery, a microbrewery based restaurant just out on North Atherton Street (and yes, as a fan of Firefly, and most especially the episode “Shindig”, I snicker every time I say Atherton). Alas, I did not have my camera with me to take pictures of the place and the food. The building is very new, with an addition currently being added onto it. The décor is basic industrial brewpub with the HVAC innards displayed. What makes this place interesting is the banners and signs displaying the logos of Pennsylvania breweries long past. Very nice touch and I’m sure probably helps cut down on the crowd noise. I can imagine this place really hopping when there is a game in town. The staff was very friendly and we were immediately seated at a nice booth. A bar occupies the center of the main room, in an “L” shape with a plentitude of taps (they also have cocktails and other beers in addition to their own). A good sized flat screen TV showed the Olympics. For our first beers, I got the Apricot Wheat and husband got the Hefeweizen. The Apricot Wheat had a strong scent of the stone fruit but not sweet. Definitely one of the best I’ve had of this type. The hefeweizen was good but not exceptional. If you like the type, you’ll like this. We both ordered sandwiches but everything on the menu looks tasty. Otto’s is very committed to local sourcing, which in PA, gets you a lot of variety. I got a daily special, a jalepeno burger, which looked to have both jalepenos and green chilis. It also had thick cut bacon (which I could easily bite through!) and a smoked cheddar. The burger was one of the rare ones that was actually juicy and cooked through with no pink squishiness in the center. I will happily eat steak tartar and carapaccio, but when I want a burger I want it with some good browning on the outside. We cook our burgers at home out of 73/27 burger which has enough fat in it to keep it juicy and have it well grilled. I got the hand cut fries with it. Husband got the beef on wick, a riff on the western NY “beef on weck”, ultra thinly sliced smoked beef brisket on a bun topped with caraway and coarse salt, horseradish sauce, and a bit of au jus on the side. Always curious on how one is supposed to wedge a fat bun into a little ramekin, but after taking a bite, you can get a corner in. He got the sweet potato fries, one of the best versions of those I’ve seen, cut in the rippled shape so there are lots of crispy edges. They did resemble caterpillars though, very scrumptious caterpillars. 🙂 Husband also got a second beer, their Spruce Creek Lager, which has a very nice hoppy floral hit but little bitterness. I would have liked to have tried more of their beers but here’s to my husband getting hired and me having all the time I want to sample.